In the spring of 2017, an idea sprouted during a first/second-grade team meeting at Prairie Crossing Charter School, located in Grayslake, Illinois. The teachers were hoping to repurpose their shared, underused outdoor spaces to be more conducive to learning opportunities and to flow with a theme. These teachers envisioned a flexible space for whole class meetings, small group studies, and refuge for solitude and calming. They wanted to incorporate cultural gardening traditions, as well as sensory elements for the inclusion of all students. We were invited to the following team meetings, as our colleagues thought we could lend insight on how to visually and kinesthetically celebrate a range of abilities and cultural diversity. The roots of this idea flourished into something much bigger connecting our staff, students, and greater community. We dubbed this space the ‘Inclusion Garden’ because the space involves, empowers, and recognizes the people that make up our community in a variety of ways. 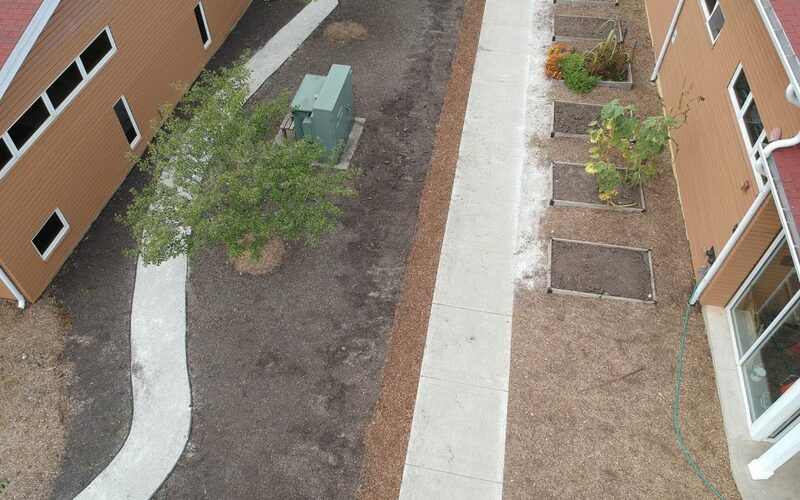 During this planning, our Inclusion Garden continued to evolve to better support and recognize different backgrounds, cultures, abilities, and learning needs. Something that has aided the growth of this space is the diversity of the planning team itself. We are colleagues that don’t always get to work alongside one another on a daily basis. A bit of magic happens when we merge our knowledge and experiences. We collaborated with another Special Education teacher, the Art teacher, the Dean of Environmental Education, and our Executive Director. We quickly learned that our diverse team yielded more shades and color to the vision – this would take time, planning, and more community to pull it off. Teachers envisioned quiet areas and awakening areas for their students’ varied needs. We work with a diverse population of students, including those with specific learning disabilities, other health impairments, and emotional, behavioral, and Autism spectrum disorders. We knew from the beginning that we wanted our students to be involved in defining the space’s purpose because it would largely celebrate and serve their differences. Staff and students have come up with many design elements that embody our collective aim for inclusion. 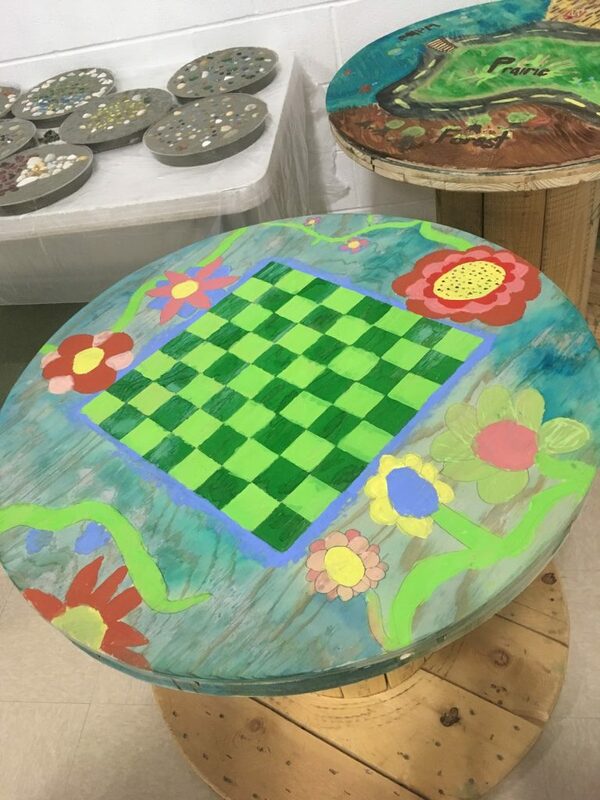 Members of our school’s Green Team prepared a community event for creating hand-painted tables from recycled electrical spools, as well as mosaic stepping stones to serve as a pathway throughout the Inclusion Garden. 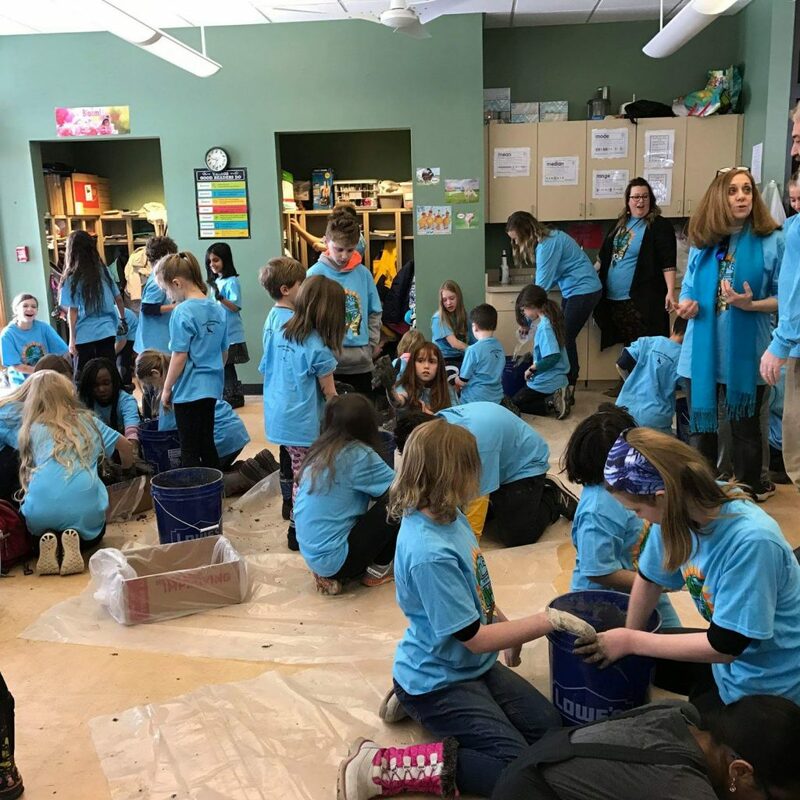 During Earth Week 2018, students in first- and second-grades, along with their fifth- and sixth-grade buddy classes, created small herb containers out of hypertufa (a cement/water/peat moss mixture), working with the Art teacher and the Resource teacher. Another element students are taking the lead on is the garden’s signage. This school year, a couple of sixth-grade students have been responsible for researching and creating a field guide for the plant life within the garden – specifically the Middle Eastern grasses and their native counterparts that frame the pathway. While they work on sharing information about these plant species, they are also working to meet individualized writing goals in a meaningful way. Our students’ thoughts, words, and designs in the garden help reflect who they are and connect them to the place. Our school is home to many ethnicities such as Indian, Bulgarian, Chinese, Pakistani, Estonian, and Congolese. Over two dozen languages are spoken at our school! Inspired by these cultures, the pathway begins with a calm, Japanese styled zen ambiance and transitions into a vibrant, multi-sensory experience. Specific flora were planted alongside native varieties to emphasize the beauty of diversity in nature, and in our community. Japanese irises bloom next to European ginger. Window boxes of coriander and sesame are framed by Korean ferns and African grasses. The space ties in with the first- and second-grade curriculum. Students learn mindfulness and write haikus in the zen garden section. Along the pathway, several learning spaces invite whole group, small group, and individual reflection for solo spots (students spend time connecting with nature once a week). Today, the Inclusion Garden is still taking shape. Our team is entering the new year with excitement to fully realize a few more design elements and community ties. Once students complete final drafts of their signs, we intend to create QR codes that will provide multiple language translations through a partnership with the Multicultural Parent Advisory Committee (MPAC). Spanish, Bulgarian, Russian, Hindi, Telugu, Polish, and Estonian translations will be gathered from our wonderful community. The zen area will be developed to include sand, stones, and rakes with a more prominent water feature. The rocks in front of the cistern will transform into a running stream when rainfall is heavier with a bridge to allow students dry passage. Many staff talked about how dark the sidewalk near the Inclusion Garden becomes at night, so we will place solar illuminated lanterns along the pathway. To celebrate the Middle East, we plan to include mosaic tiles, a natural xylophone, and an archway with climbing greenery. 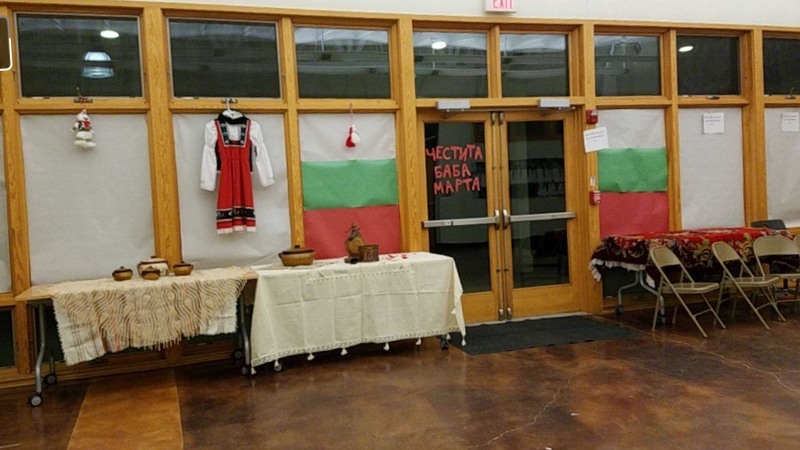 A more recent tradition at Prairie Crossing has been celebrating the Bulgarian holiday, Баба Марта or Baba Marta day. Celebrated for hundreds of years, this holiday focuses on rebirth and the coming of spring. Baba Marta means Grandma March, personifying the tumultuous nature of the month of March. As the myth goes, Grandma March is often annoyed with her brothers (sometimes husbands) January and February. So the month can switch between spring, with the sun coming out when she is pleased, and winter, when she takes away all warmth and makes the weather miserable. It is also said that she completes her pre-spring cleaning at that time and the snow is all the dust from her house. Bulgarians will wear martenitsi as an amulet to make Grandma March happy so that spring comes quickly. A мартеница or martenitsa is made of red string (representing life, passion, and the setting sun) and white string (representing purity, newness, and fresh snow) that are woven together and worn on the wrist until the wearer sees a blooming tree. Then, they tie their bracelet to the tree to wish it health and luck. This tradition has been a great tool for partnering with our local Bulgarian community. With the help of the MPAC, we have been able to bring in parents and students to teach about this holiday and share lessons based on historical Bulgarian myths. We were even fortunate to bring in Bulgarian chefs for our monthly Farm to Table to share authentic cuisine with students. The English Learner teacher partnered with our Environment Education leaders to lead nature walks focused on the phenology associated with the holiday. As winter turns to spring, the school campus is speckled with tiny red-and-white strings tied to bushes and trees. The continued development of the Inclusion Garden will create an intentional space for these types of festivities. A lesson we are in the midst of learning is that this project has taken time and patience to manifest. In the last year, we made a commitment to become a Green Schools National Network Catalyst School and developed two long-term goals, one of which is centered on our school culture – “PCCS commits to an inclusive culture of sustainability and caring for self, others and the environment…today and tomorrow.” We believe that development of the Inclusion Garden is helping us realize this goal and that it will create resilience in our community. Every child has different abilities and needs. Every person has a different story to tell. Every community has hardships and celebrations. Our hope is that this garden will strengthen our roots and continue to spread outward. We strive to include, connect, and value the people in our community. Melissa Plucinski is a Special Education Resource teacher at Prairie Crossing Charter School. She earned her B.Ed at Goshen College in Goshen, Indiana. In 2016, Melissa earned her M.Ed in Curriculum and Instruction: Environmental Education through Concordia University Portland. Robb Freeman is the K-8 English Learners teacher at Prairie Crossing Charter School. He earned his B.Ed at Loyola University Chicago and studied at the Université de Nantes in France. Robb taught Pre-K through first-grade English while living abroad.